My son and I were fishing for trout or pike on Quail Lake in Colorado Springs using a fire tiger spoon with 6 pound test fishing line. I was fishing the edge of the lake when my line got stuck. I thought it was stuck behind a rock since I was working so close to the rocky shore. I began to move toward the spot when I felt movement on my line. There was something alive at the end of the line after all. Given the action I thought I had hooked a pike. 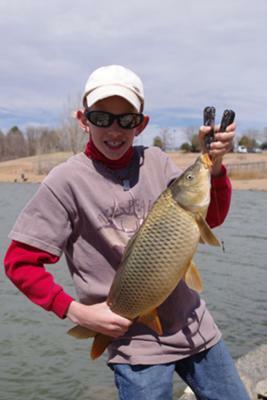 But after a 5 minute fight and the help of my son, we landed this beautiful 9 pound wild carp. After taking some pictures with my son who was ecstatic, I detangled my lure from the old line, removed the old hook still lodged in the corner of the carp's mouth, and then released it to its long awaited freedom. This one is to date our biggest catch this year.